Long time didn't been here and update my Movie Freaaak!! And she get a curse from a "witch"
In Scotland, King Fergus of Clan DunBroch presents his young daughter Merida with a bow for her birthday. While practicing, Merida encounters a will-o'-the-wisp. Soon afterwards, Mor'du, a giant demon bear, attacks the family. Merida escapes along with her mother Queen Elinor while Fergus fights off the bear alongside his men at the cost of his left leg. 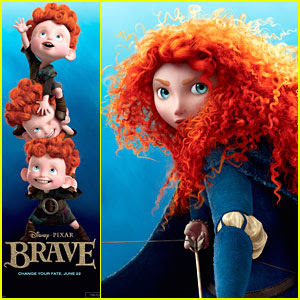 Years later, Elinor has since given birth to identical triplet boys, and Merida has become a free-spirited and adventurous teenager. One night, her mother informs her she is to be betrothed to one of her father's allied clans: Dingwall, Macintosh, or MacGuffin. 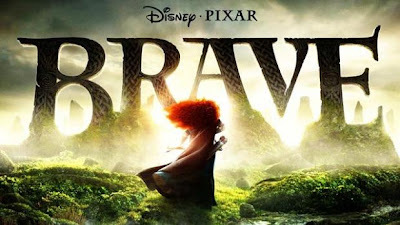 Oblivious to her mother's attempts to appease her by telling her a legend of a power-hungry prince who broke off from his duty and caused the ruin of a kingdom, Merida is dissatisfied with the arranged marriage. 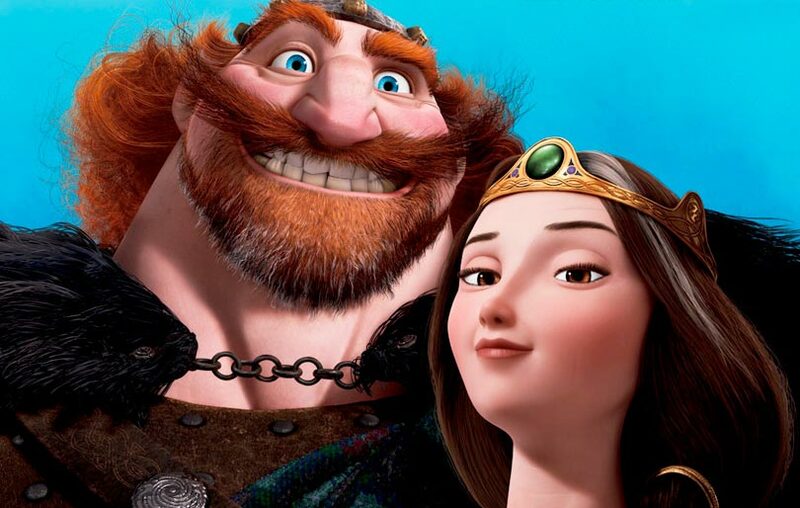 The clans arrive with their first-born sons to compete in the Highland Games for Merida's hand, and the princess chooses archery as the main event. During the competition, Lord Dingwall's son wins by accident. 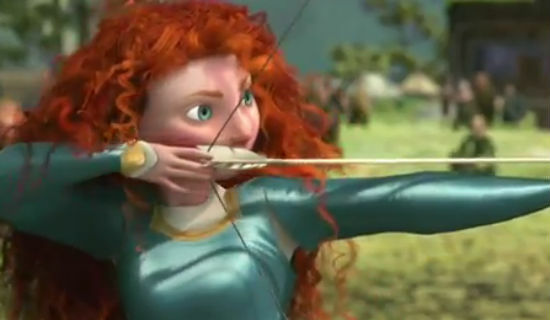 Merida then enters the competition, declaring herself eligible to compete for her own hand as the first-born of Clan DunBroch. 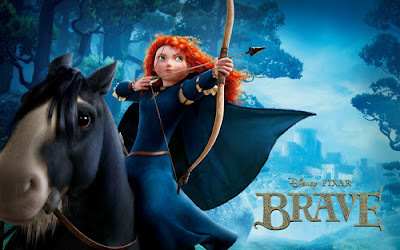 Furious, Elinor has a falling out with Merida resulting in the queen burning Merida's bow and Merida ripping a family tapestry before fleeing into the woods. While there, the will-o'-the-wisps lead her to the hut of an elderly witch who insists she is a wood carver. After some bargaining, the witch agrees to give Merida a spell, in the form of a cake, to change her mother. Merida returns to the castle and gives Elinor the cake, transforming her into a bear. 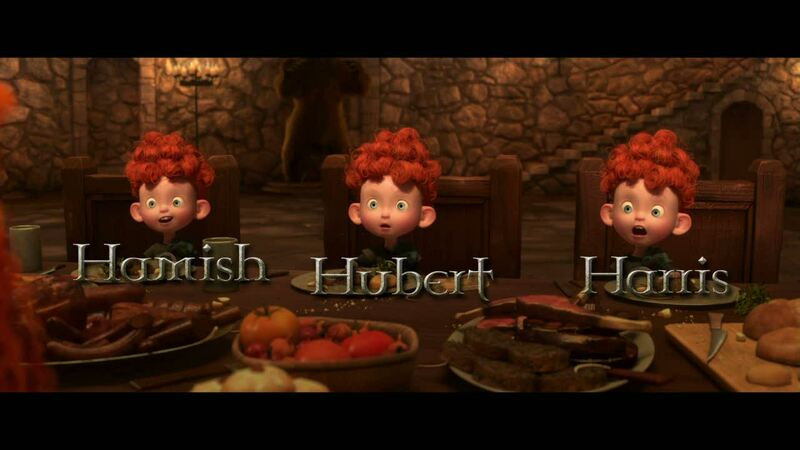 With the help of her brothers, Merida gets Elinor out of the castle. The pair return to the witch's cottage, finding the witch gone. Through a potion-controlled automated message, Merida discovers that the spell will be permanent unless undone by the second sunrise. The witch leaves Merida a riddle, mentioning that she must "mend the bond torn by pride." 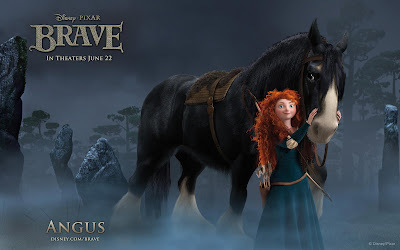 Merida and her mother begin to reconcile their relationship, however, Merida observes the spell to be slowly becoming permanent, transforming Elinor into a wild bear. Later, the pair encounters the wisps again and follows them to ancient ruins. They learn that Mor'du was once the prince of Elinor's legend, and received the same spell from the witch. 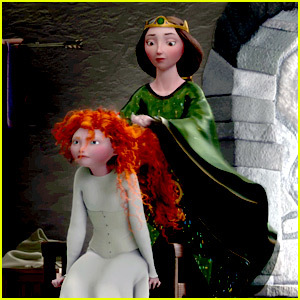 After fleeing an attack from Mor'du, Merida theorizes that the repair of the tapestry will turn her mother human again and prevent her from becoming like Mor'du. At the castle, the clans are on the verge of war because of Merida's actions, but the princess quells their fighting and declares that the children should be allowed to get married in their own time. Her suitors second her and the lords agree. Merida then sneaks into the tapestry room with Elinor, who once again loses her humanity for a few minutes. Fergus goes to his bedchambers to find Elinor, but mistakes her to be dead after seeing the room destroyed. Elinor attacks both Merida and Fergus when he steps into their room. Upon regaining human consciousness, she races out of the castle in desperation. Thinking that Elinor is Mor'du, Fergus detains Merida and follows Elinor. With the help of her brothers, now transformed into cubs from eating the cake, Merida races after her father while fixing the tapestry. 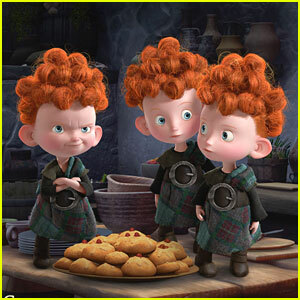 The clan members and Fergus capture Elinor, but Merida intervenes. Mor'du then appears and attacks Merida. Elinor kills Mor'du by luring him under a falling menhir, setting the spirit of the prince free. 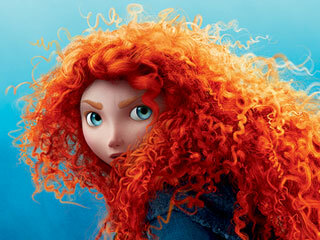 Merida places the tapestry over Elinor, hoping that her mother would change back but nothing hapened. 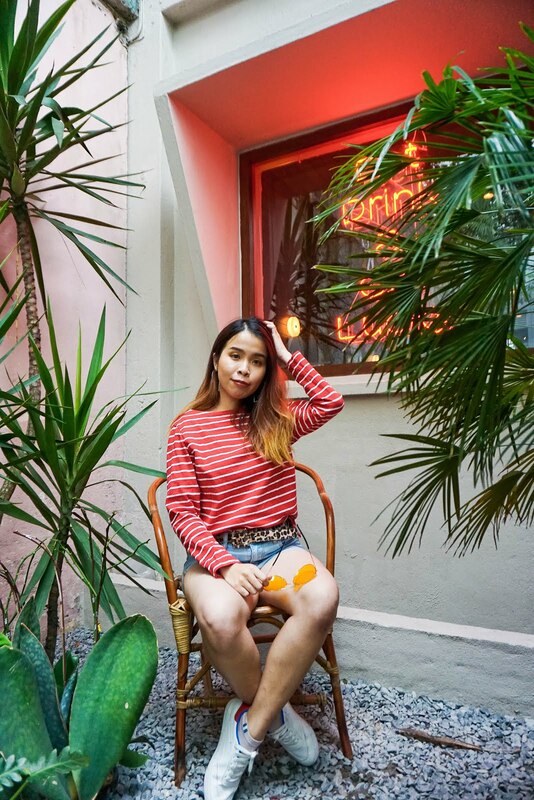 She professes her love for her mother and apologizes while crying. Elinor is transformed back along with the triplets, and the family is reunited once again. 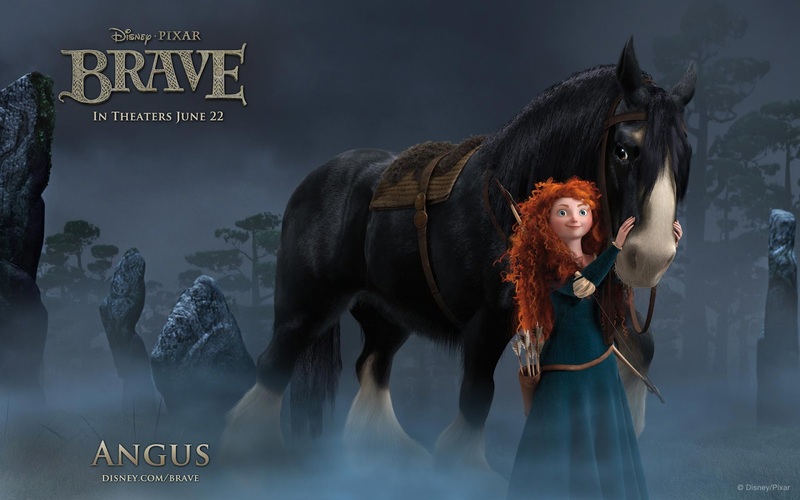 A few days later, the clans depart for their respective lands and Merida and Elinor ride their horses together. That I choose to watch on my 21st birthday!! Is a brave brave journey to step on and find our own fate and destiny♥ CHEERS! !